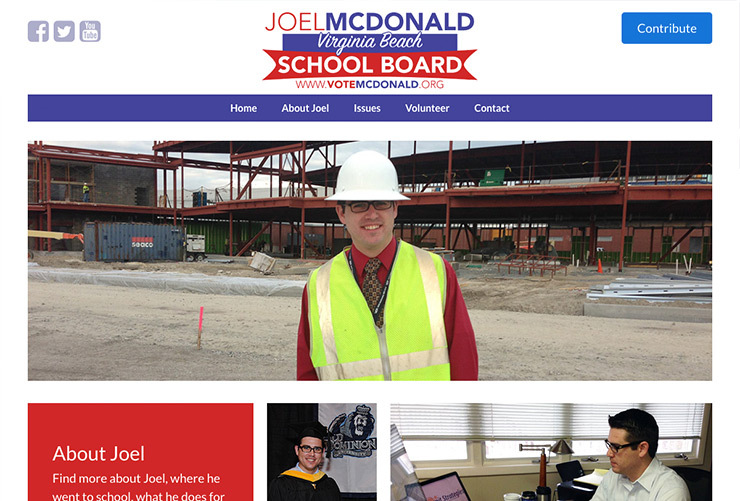 This is my campaign site when I ran for re-election to the Virginia Beach School Board in 2016. My campaign was successful, and I was pretty happy with the website. Winning my election of course. I did the design and development of this website. I made sure to incorporate photos from the last four years to show some of the things I had done and been involved in as a school board member. As in many of my projects, Gravity Forms powered a lot of the functionality of this site. Anytime a contribution was made, a contact form was submitted, or someone signed up for updates, that data was all synced via MailChimp. Financial contributions were processed by Stripe allowing donors to stay on the site when making their contribution. One of the challenges to a campaign site is presenting issues in a way that doesn’t create pages with a massive amount of text, but also allows for good explanations. For this site, I used collapsible boxes for each issue, allowing users to easily browse issues and get a general sense of where I stood, but also allowing them to expand the issue to learn more.